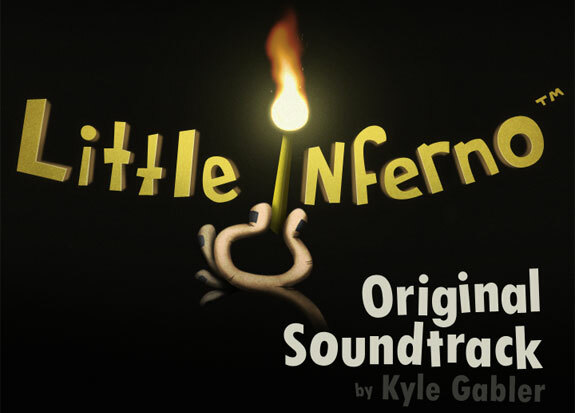 Thank you to everyone who asked about the soundtrack to Little Inferno! It’s been fun and educational putting this together, and I’m happy to make the full soundtrack available here, below, for free. I’m a big fan of movie music from the 80’s and 90’s – like John Williams (1993 was his most amazing year), Danny Elfman’s 90’s heyday, Vangelis in the early 80’s – all with strong melodic themes and instantly identifiable orchestration. It was my goal with this soundtrack to write music that sounded like it could have been written in that time of VHS tapes and Stan Winston special effects, with clear, hummable melodies for each character and theme. For the curious musicians reading this, I used a music program called Reaper to create all of the music – a lightweight DAW that’s less than 8MB, fast, and well designed. Weirdly, though, it has no form of classic staff notation, which was disorienting at first, until I got used to clicking notes into a piano roll. Almost all instruments are from my collection of old SoundFont2 files, converted to SFZ format with sfZed, and played back with the free SFZ sampler. I also used a few instruments from the ambitious open source Sonatina Symphonic Orchestra. PS. You can find my World of Goo soundtrack here. Please link to this site (http://tomorrowcorporation.com/little-inferno-soundtrack), not directly to the files below. Thanks! Although I am providing this soundtrack here for free, it is still a copyrighted work just like any CD you might buy in a store. That means this music is not for use in other movies, games, tv shows, etc. If you would like new or existing music for a project you are working on, feel free to contact me. Everything you need to know about Little Inferno is here. Little Inferno is a quiet introverted art project masquerading as a loud extroverted shopping game. For a long time, we weren’t sure which face of the game to portray in the opening sequence, but eventually decided on this one. Miss Nancy is large, warm, and smells like cinnamon. She’s like a nice fluffy couch that you can’t climb your way out of. We’ll hear this melody again, twisted up, in “Gate Operator, Open the Gates!” and “Miss Nancy Remembers”. The Sugar Plumps tracks were some of the most difficult to write. She’s a character that’s supposed to be, initially, totally vacant. Players are supposed to disregard her as a lame NPC sending you useless letters, like in Animal Crossing. But as the game progresses, she becomes more and more aware of her (and your) situation. I needed a melody that could withstand the transition along with her character, throughout each of her four tracks. The Weatherman, everyone’s favorite character! There’s a reason his theme is the same as the game’s theme (with different instrumentation). Musical effects for items were fun to write because the stakes were so low and nobody cared if they sucked. A relief, compared to the thought and hand wringing that the other tracks required. This one took only a minute or two to create! Sugar Plumps track 4. Still her melody and instruments, but over different chords, and with the beginning part flipped vertically, sort of? 13. Ooo It’s so Bright! A mystery character, staring at the Tomorrow Corporation sun logo. “Is it rising or is it setting? !” The upcoming Tomorrow Corporation “Gates” sequence is teased here. 15. Gate Operator, Open the Gates! Music for folks who like to make spreadsheets, check things off lists, and tango by the book. Miss Nancy was on a similar journey as the player, and this is her turn to do what the player is in the process of doing. So it needed to be adorably flamboyant, in her style, with her melody. Listen carefully – my handsome and talented boyfriend is on cello! It’s the only real instrument used in any of the tracks. The main theme, minimal version. Little Inferno has always been a difficult game to describe, so we knew we needed a short, simple way of communicating what it was all about. This old timey jingle is the result. Kyle Gray’s friend Travis Hill provided the perfect “narrator” voice, with a welcome bit of Phil Hartman smarm. 22. Tomorrow Corporation, the Future is Tomorrow! Also used as the Wii U version startup sound.